The plan for today was to take the local bus to Daventry for a change in scenery. Jan had the bus timetable showing the No10 bus from Rugby to Daventry passing the marina gate. I had my doubts after walking to the bus stop the previous night. On arrival at the bus stop it became obvious the bus route had changed and the No10 no longer passed this way. We would need to catch a No9 or No140 into Rugby to then catch the No10 to Daventry. A short time later the No140 arrived from Leicester so we flagged it down and boarded. Jan placed her National Bus Pass on the electronic ticket reader and the LCD display showed “Invalid Pass”. Not a problem we thought. This has happened on previous occasions because our passes were issued in Berkshire and frequently not recognised in other shires or council areas. The driver then said with a very serious face “You’ll have to buy a ticket!” We’ve had our leg pulled before by bus drivers so we both had a chuckle and went to walk past him when he said louder and more seriously “YOU’LL HAVE TO BUY A TICKET!” Jan started to remonstrate with him pointing out we had valid passes. He wasn’t budging from his position. I just said “Forget it Jan” and we got off the bus. We then walked into Rugby to catch the No10. The experience was rather annoying and I’ve written to the bus company (Arriva) to describe what happened (not a complaint) and ask whether they accept the National Bus Pass and what their policy is when the electronic reader declares the pass invalid. The walk into Rugby will have been good exercise so I’m not grumbling. We had a 40 minute wait for the No10 bus and an interesting journey through the countryside and small villages arriving at Daventry bus station which is adjacent to the large Tesco supermarket. Jan also noticed the ALDI and Waitrose supermarkets. As we are in the area for four months the plan was to only have a superficial look around thus enabling further exploratory visits. However Jan had suggested we visits “Quinns” footwear on the High Street as they were reputed to sell Northwest Territory boots. Readers might recall we attempted to buy Northwest boots in Small Heath, Birmingham. Anyway, we reached Quinns and they had a reasonable selection of Northwest Territory boots in stock. Jan had taken a pair of thick walking socks just in case we did find boots. Apparently there were only men’s boots but that didn’t stop Jan trying them on. To my surprise we both take the same size. Even more surprising was I usually take a size 9 but they were too big. When I tried the size 8 it was a good fit. Unfortunately all the size 8 boots were the same colour so Jan has to somehow mark her pair to ensure I don’t walk off with them! The boots haven’t been purchased with the intention of doing serious tramping rambling. 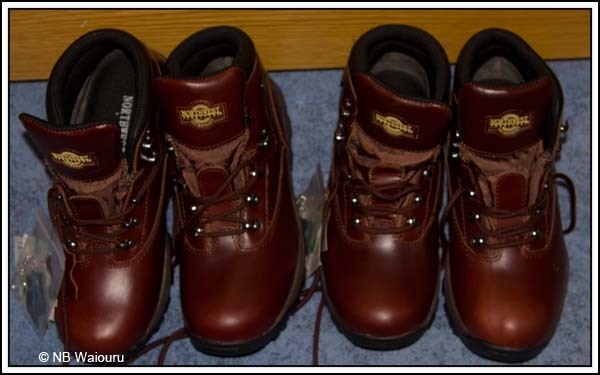 Rather, they will be winter and wet weather cruising boots, plus used for towpath walks. Apparently Jan told the female shop assistant I will be cleaning both pairs! The summer footwear is being cleaned and dried ready for storage. Back at the Daventry Bus Station a decision had to be made whether to catch the No10 or No12 bus back to Rugby. The No12 would take a different route via Braunston so we’d have a change in scenery. However there was a 40 minute wait for the next bus so we opted to take the waiting No10. The trip back seemed much shorter? Along the way we did a short detour into the DIRFT. Now we’d previously seen signs for the DIRFT and I’d even noticed there were a number of very large warehouses and a rail yard. Today I think I realised the DIRFT means Daventry International Rail Freight Terminal. Back on Waiouru I had a quick search in Google to find my assumption was correct. Wikipedia has more information <here>. Back in Rugby Jan purchased some cotton thread so she could continue sewing the covers for the porthole bungs. She also (sensibly) decided to buy a thimble. There was another 40 minutes until the next No9 bus back to the marina so we decided to walk. Of course it rained on the way back! Not an overly exciting day but at least a trip away from Waiouru. You are lucky, my bus pass is issued in Berkshire and it is never recognised as valid anywhere - not even in Berkshire! !